Queen Beans and Wannabes: 2 Live Crew Ain't Got Nothin' on the Flag Crew! 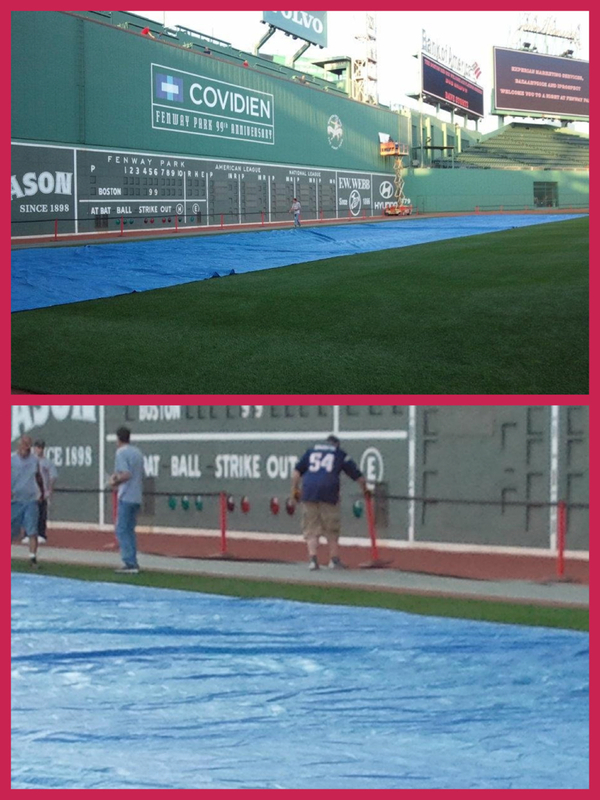 This past 4th of July, I was asked once again to be a part of the Boston Red Sox “Flag Crew”, a mixture of Red Sox employees & volunteers (people who know people who know the employees), to help out getting the giant American Flag folded up onto the Green Monster then help toss the flag to drape over the Monster the next day. I have been asked a few times to help out fold and toss the flag and each time feels better than the last- mainly because I know exactly what to do without getting lost. I’m going to back up a bit and tell you how I got stared with the ‘crew. It was a typical Tuesday during work, until I got a cryptic message from Zach (yes, the same Zach from SkeeBall), asking me to meet him at Fenway Park at 6pm. That was the entire message said. Of course, I had asked why and the only response was ‘be there. 6pm. won’t regret it.’ Ok. I had only known Zach & Heather through 1 season of SkeeBall and we were rolling on season 2, so I had no idea what the message meant, especially since there was no game that night. 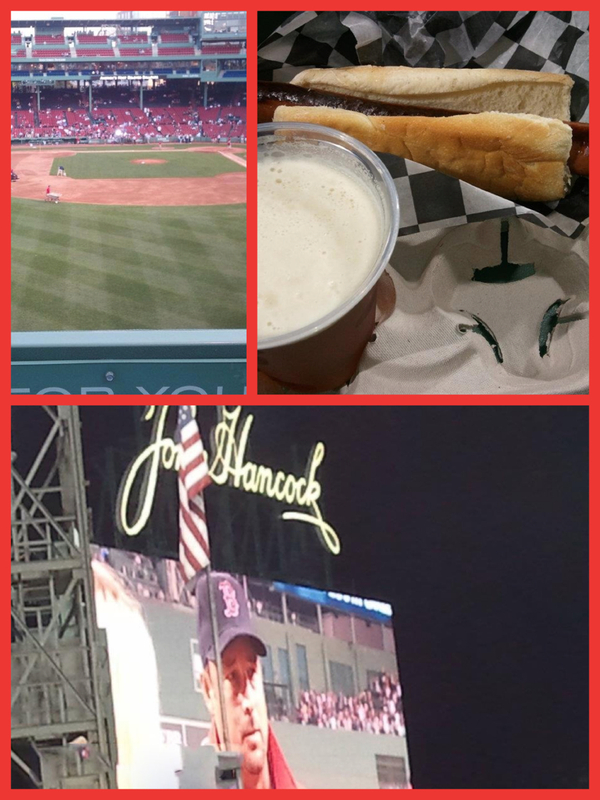 I decided to take my chances and see what it was all about, if nothing else, it was a nice night to walk around Fenway during a non-game day, fewer crowds. 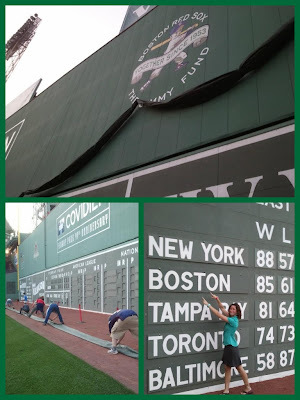 As soon as the bell rang for 5pm, I ran out of work (in full work clothing blouse & skirt), over to Fenway Park to be there by 6pm on the dot. As soon as I rounded the corner to Yawkey Way, I found Zach waiting for me by Gate D. He gave me a bracelet and told me to ‘come on in’ to the Park… very nonchalant like he simply owned Fenway Park. As I followed him into the park, I kept trying to ask him what exactly we were doing here with to no avail. I had also noticed that we kept passing the concession stands and seating areas and walked into a ‘restricted area’, where the grounds crew, the physical therapy and behind the scenes employees’ offices were all located. We made our way around to a door located by the grounds crew equipment and Zach had asked me one last time, “Do you know where we are yet?” For a split second, I got the feeling I was in one of those many horror films I watch and Zach played the starring role of ‘psycho killer’ and me, ‘helpless victim #2’, and he was going to chop me up into pieces and scatter my remains on the field. Once I got back into reality a nanosecond later, Zach had opened the door that led right onto the outfield of Fenway Park! 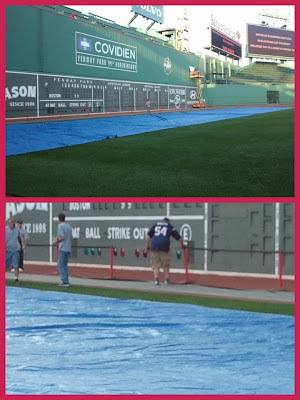 I mean, I was actually ON the field, walking around, touching the grass, seeing the dings on the Green Monster and out laying on the field, was some blue tarp and a wheeled out bin with the work ‘flag’ written on it. Zach asked me if I understood what was going on … still having no idea… and he said to follow along and pay attention. 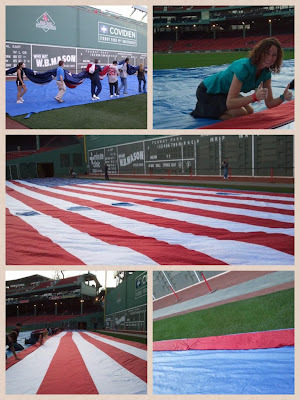 Flag Crew Insider: The Flag Crew is a mixture of Red Sox Grounds Crew, Red Sox Employees and people who happen to know people referenced before. The Flag Crew comes down either right after a game has ended or on an off day, help lay out the flag on the outfield (under blue tarp), roll it up, and send it up the Green Monster. The next game day, the Flag Crew returns to either help toss the flag and drape it over the Monster or be on the warning track to help hold it down/catch the flag. The Flag Ceremony is usually held on: Home Opener, any national holiday, some Yankees/Cubs/special games and on the anniversary of 9/11. There was a mixture of about 20 people (grounds crew, ‘veteran’ flag crew & newbies) on the warning track getting ready to ‘follow orders’ from Johnny…aka Zach’s cousin. Johnny was like your typical drill sergeant, having us line up along the third base line explaining what would be happing, how we should take the flag and lay it on the tarp and whatever we do… don’t touch the white foul line! Once we were lined up, we walked over the wheeled bin and grabbed a piece of the flag over our shoulders and walked along the edge of the tarp to lay out the flag. After the flag was fully laid out, it was time for what I would now call the ‘roll & tot’, where Johnny would yell at us to ‘roll the flag up to half a stripe or star’ depending on where we were and make sure it was flat, tot and all the air was out. even though I tried to pay attention as best I could, I really couldn’t believe this was all happening and since I didn’t think any of my friends would believe me, photos were a must….except that I kept getting my camera folded under the flag…oops. Once the flag was fully rolled up, (extra flat and tot), Johnny was there to give us orders to ‘pick up the flag with our arms and palms up, lower the flag on the green tarp and step back’. This was all done very orderly so Zach and a few other people could tie up the tarp and get it ready to be sent up the Green Monster. The same orders were followed for that actual part as well for taking the flag over to the Monster. After all the hooks were on, it was time to send the flag up the Green Monster where it would lay until the next night when it would tossed over the side and draped over the Monster. Zach had informed me that we could come back the next night and help toss over the flag- to which I immediately said ‘yes’! 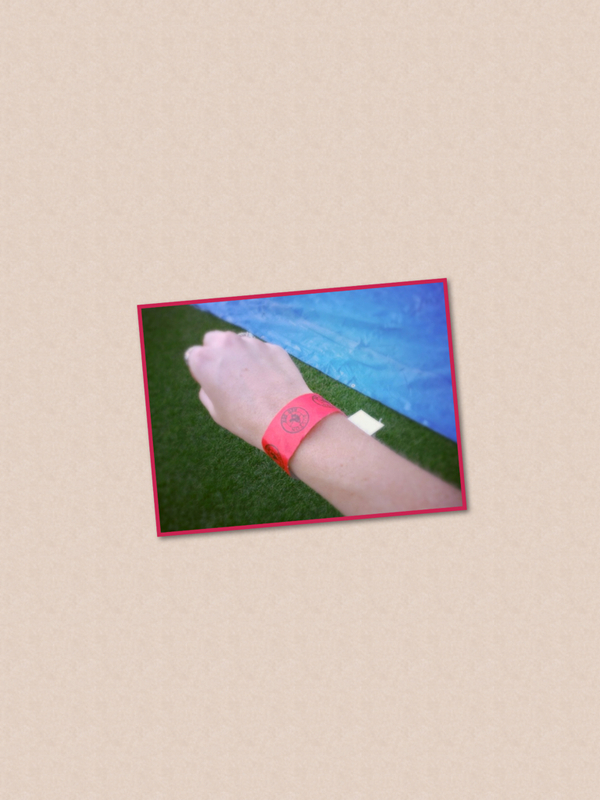 We had met at the same area the next night and had met Johnny for our bracelets- I was feeling like VIP since I got to beach the crowds and walk right into the ballpark without a ticket. We made our way up the Green Monster, flag still intact and ready to go. Zach had mentioned to me what usually happens- we toss out the flag on cue, let it drop into the arms of the soldiers who were below us, they would walk off the field with it our job was done. After that, we could either wait until people claimed their Monster seats or we can walk around the ballpark. Once the ceremonies and the memorial for the victims of the September 11th attacks were read, it was time to get ready and wait for our cue to toss the flag over the Monster. I must admit, I was rather nervous about this part; I didn't want to be the one who missed the cue and didn't toss it on time. 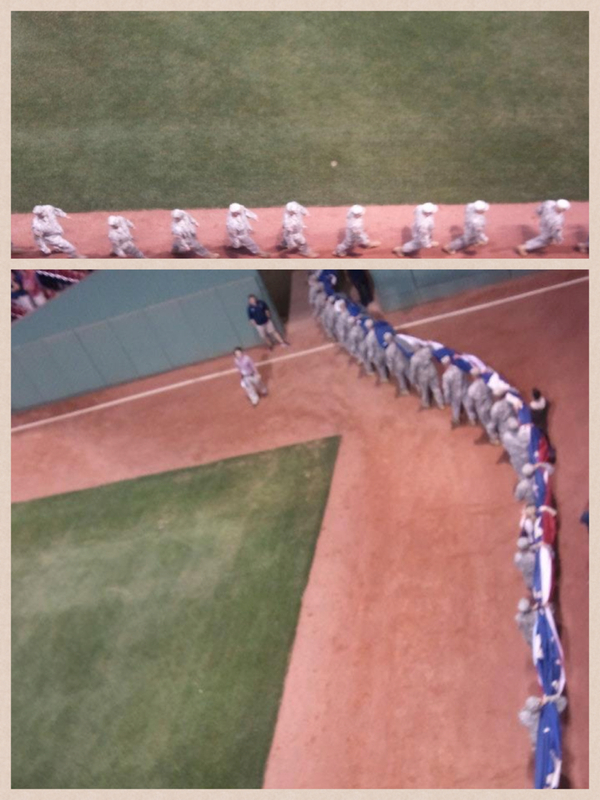 But, it all went as planned and the flag draped over the Green Monster in all its glory. Once it was again on cue to drop the flag down to the soldiers, it was now time to relax and watch the game… which was coincidentally Tim Wakefield’s possible 200th win as Red Sox pitcher. Still goes down as one of the coolest nights I ever had in Boston!